The tenth year of marriage celebration is the first of the major milestone anniversaries. As you celebrate this special 10th wedding anniversary, think about the durability of your commitment to one another for a full decade. Here are some tenth anniversary ideas and symbols to help you plan a wonderful and meaningful celebration. Tin or aluminum. The pliability of tin and aluminum is a symbol of how a successful marriage needs to be flexible and durable and how it can be bent without being broken. Diamond jewelry. A marriage that lasts ten years is as durable and beautiful as a diamond. Check out the great collection of diamond jewelry available on Amazon.com. Diamond jewelry or blue sapphire. 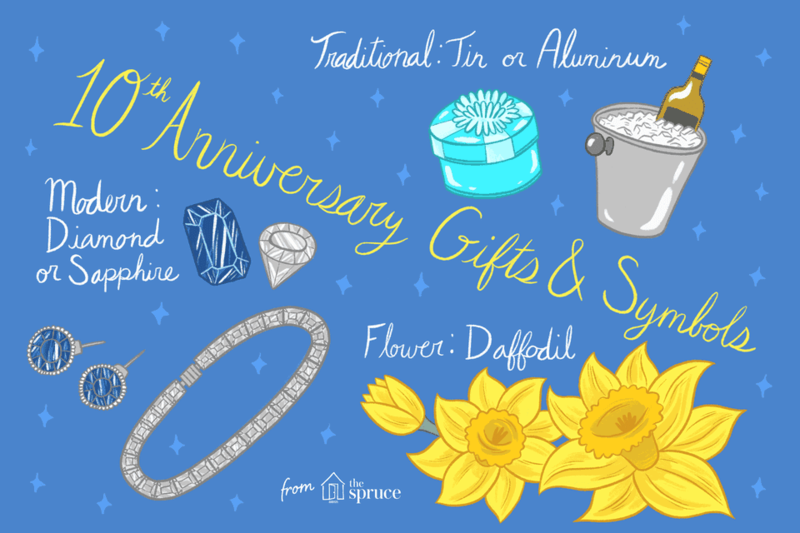 The 10th-anniversary flower is the daffodil. Trumpet-shaped daffodils represent joy, cheerfulness, and happiness. Purchase tickets for a movie, sports event, concert or play to attend together. Buy some wine, bread, and cheese and find a nice spot to have a romantic afternoon. Pick a bouquet of daffodils from your garden if your anniversary is in the spring. Stuff a pretty tin box with new paper money, confetti, love notes, books on romance, magazines, love coupons, a current picture of the two of you, etc. Put together a CD with songs from the year you were married. Assemble a memory photo album with pictures highlighting your 10 years together. Write a love note with daffodils printed on it. Make "love coupons" for your sweetheart. Try making a "time capsule" with facts, clippings, pictures, songs and memories from the day or year you were married and the day or year of your anniversary.